Flash Your Samsung GALAXY Y and See LMFAO Live, for FREE! Over 1,000 FREE tickets to see LMFAO live in concert up for grabs! Get TWO TICKETS by just flashing your Samsung GALAXY Y on 10th of March. 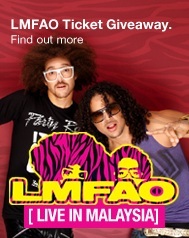 Each Samsung GALAXY Y owner is entitled to redeem 1 (one) pair of LMFAO Live in Malaysia concert tickets upon presenting their Samsung GALAXY Y. Tickets are on a first come first serve basis, while tickets last. Only Samsung GALAXY Ys bearing the Samsung Warranty Label are eligible for ticket redemption. Don't have a Samsung GALAXY Y? Join the Shuffling contest and you can win LMFAO tickets too!